Wednesday nights (Thursday in the Philippines) will never be the same again as Survivor opens its 30th season on February 25, 2015. Worlds Apart introduces eighteen new faces divided into three working class. By definition, the white-collar performs managerial work in an office setting. Common examples are CEOs, computer programmers and marketing directors. The blue-collar focuses on manual labor, which involves physical strength. Common jobs include mining, construction and warehousing. The no-collar confuses me a bit. By definition, it means unemployed but Survivor wants to define it as someone who is free spirited who breaks the rules. Question: Who are my early favorites? Before that, a brief recap of San Juan Del Sur. The season declined in ratings after Jeremy was blindsided in Episode 9. Episode 10 showed a fiber of surprise when Jon played his hidden immunity and Wes was sent home by only two votes. Episode 11 was predictable and as expected, the alliance ousted Reed. Episode 12 began the rise of Natalie Anderson as she broke her alliance and helped voted Alec out instead of Keith. 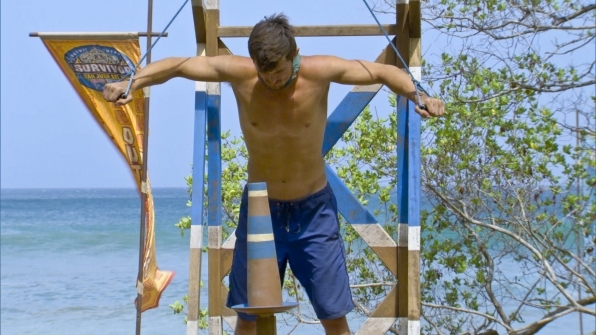 Luckily, Episode 13 stirred the drama and 9.47 Million Americans saw how Natalie outplayed Jon in the immunity challenge, which involved balance and focus. It’s Jon’s biggest mistake not to win the challenge. It’s his only chance to advance in the Final Five. It’s Natalie’s game who reigned supreme throughout the SJDS Finale. She wasted no time and blindsided Baylor. Missy sat out during the final immunity challenge due to ankle injury but she still made the Final Three after Keith failed to win. Five of eight jury members (Keith, Alec, Wes, Jeremy and Josh) handed the title and million dollar prize to Natalie, who showed the right mix of flexibility and aggression after Episode 9. SJDS was the first season since season 21 which I don’t have an early favorite in Final Four. It felt disappointing, yes, but it’s still a good entertaining season. I’ll remember Natalie an “okay” winner. Going forward, here are my early favorites for Worlds Apart. Hopefully, one or two of them will make the Final Four or, one will win it all. “I can’t wait to prove myself.” Tyler describes himself as achiever, competitor and manipulator. Of all the past contestants, he adored Boston Rob for his ability to cut throat while making his way to the top. An accomplished career person with two master degrees and with Steven Spielberg as his life inspiration, Tyler experienced the life with dragons and snakes. He works with them every day; therefore, he felt confident enough to use what he learned and outwit, outplay outlast the seventeen strangers. Question left unanswered: How will Tyler deal with whiners when he hates them? “I live for extreme experiences!” Adored Ozzy, Cochran and Parvati in their seasons, So aims to become the legendary female sole survivor who doesn’t hesitate to play big moves. Outside the game, she managed to re-invent herself despite of all the challenging moments – divorce, changing jobs, changing homes. She feels positive to use her experiences as a vehicle to survive the physical, mental and emotional aspects of the game. She expects herself to do well in challenges, to enjoy the present and to manipulate people to save herself. Yet, So describes herself as a “brutally honest” person, how will it change her big moves? “My physical, mental and emotional capabilities are of a man’s level.” Sierra hailed from Roy, Utah in which she’s a national champion and all-around cowgirl in high school rodeo. She describes herself as competitive and athletic; that’s why, she’s mostly into outdoor activities such as basketball, hunting, fishing, volleyball and football. She decided to join the show because she believes there’s little she can’t do. As Parvati her most liked contestant, Sierra considers herself as a positive strategist who can push herself beyond the limits. I’m wondering, how will she survive once she becomes a threat? “If I have to die, I will before I quit!” Mike joins the show because he feels there’s a competitive fire inside him. Outside the game, he learns to adjust whatever life throws at him. One, he saved money to pay his house in two and one-half years. Two, he survived bullying and molestation. Three, he took drastic measures to make things right at work. A firm believer of constant change who is also determined to play as the season’s villain, Mike picks Cochran, Ozzy and Rob as his past favorites. Will he make Texas proud? “I grab everything I do by the horns…” Hali loves surfing, jiu jitsu and motorcycles. She feels she’s the type of person who is free, tenacious and focused. She adores Parvati due to her ability to stay fearless against rejection and to plan with calculated risks. She considers herself as a social person who can effectively handle the emotional pressures needed in the game. It’s also noted in her profile Hali doesn’t let go until she gets what she wants – I’m curious, how will she control her game in which flexibility is required? “The game is a true test of self-awareness…” With his athletic and competitive qualities, the creative, compassionate and charismatic Joe believes he’ll be an asset to his tribe. He feels he’s sociable enough to connect with other contestants. He knows how to listen to their stories and he will work hard both around the camp and in challenges. Sure, a successful implementation of these strategies can help him last longer. Yet, will he still play like Malcolm and Ozzy even if he’s surrounded with rude and inconsiderate strangers?